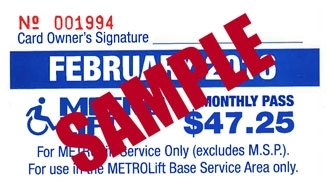 METROLift Base Service Area Monthly Pass – Pass is not refundable, not reimbursable, and not transferable. Your monthly pass is good for unlimited rides on METROLift, inside the METROLift Base Service Area only. This pass must be signed on the front to be valid. This pass may not be laminated or have a plastic cover. NOT FOR RESALE.